Researchers say they could build a prototype of a molten salt reactor, a safer, cleaner nuclear power option, in 10 years. WHY IT MATTERS: Nuclear power offers a zero-carbon energy resource to replace fossil fuels in the short term. Molten salt reactors like this one, built at Oak Ridge, could be operating by the early 2020s. For years nuclear scientists have talked about a revival of molten salt reactors, which are powered by a liquid fuel rather than solid fuel rods, that will help spark the long-awaited “nuclear renaissance.” Recent developments indicate that this alternative nuclear power technology is finally making gradual progress toward commercialization. A consortium of research institutes and universities working under the aegis of the European Commission, including the Technology University of Delft (TU Delft), in the Netherlands, France’s National Center for Scientific Research, and the Commission’s Joint Research Center, in Brussels, in August embarked on a four-year research program designed to demonstrate the safety benefits of molten salt reactors. Called “Safety Assessment of the Molten Salt Fast Reactor,” or Samofar, the effort will lead to the building of a prototype reactor in the early 2020s if all goes as planned. 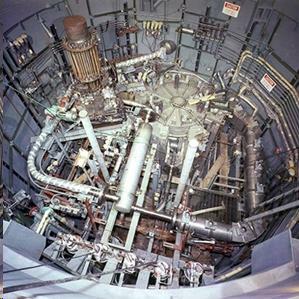 First built and tested in the 1960s, at Oak Ridge National Laboratory, molten salt reactors would be the first genuinely new technology for nuclear power generation to reach the market in the last three decades. Producing zero carbon, they use a radioactive solution that blends nuclear fuel with a liquid salt. They can run on uranium, but are also ideally suited for thorium, an alternative nuclear fuel that is cleaner, safer, and more abundant than uranium. Molten salt reactors also offer inherent safety advantages: because the fuel is liquid, it expands when heated, thus slowing the rate of nuclear reactions and making the reactor self-governing. And they’re built like bathtubs, with a drain in the bottom that’s blocked by a “freeze plug.” If anything goes wrong, the freeze plug melts and the reactor core drains into a shielded underground container. They can operate as producers of thermal power or as “burner” reactors that consume nuclear waste from conventional reactors. Essentially, molten salt reactors could solve the two problems that have bedeviled the nuclear power industry: safety and waste. While the advantages of molten salt reactors have been understood for some time, they remain at the R&D stage because, in the post-Fukushima era of low-price natural gas, it’s hard to convince investors to fund any alternative nuclear technology. In the United States it can take a decade or more, and hundreds of millions of dollars, just to bring new a reactor design to the Nuclear Regulatory Commission for a license application. Samofar is focused on fast reactors, which are more efficient than conventional light-water reactors and can breed fissile elements from nuclear waste. The researchers will build experimental laboratory facilities—not, at least for the next few years, an actual working reactor—to test the geometry of the freeze plug, the corrosion profiles of vessel and pipe materials, the behavior of the liquid fuel during circulation and draining, and other key safety metrics. The most advanced program for liquid-fuel, thorium-based reactors is in China, where the Shanghai Institute of Applied Physics reportedly plans to build a prototype in the next few years. The Shanghai program is a collaboration with Oak Ridge National Laboratory, where molten salt nuclear technology was born. This entry was posted on 4. September 2015 um 15:33	and is filed under Artikel. Verschlagwortet mit: Molten Salt Reactors, Nuclear Plant, Technology Review, Thorium. You can follow any responses to this entry through the RSS 2.0 feed. You can leave a response, oder trackback from your own site.